Innovative software utility solutions from the best in download catalogues! Browse the asked-for software programs families, watch the hottest releases of the notable programs apps, and download forthwith! Do not lose an opportunity to setup the first class software programs: apply SoftEmpire website to setup tools for free. Meet the catalogue of free utilities and package versions. take among Windows and Linux applications, try planners, firewalls, and all other varieties of software apps for your PC or cellular devices! This LAN Chat software is compatable in LAN, VPN, WAN, Terminal Service, Wi-fi Networks. Software does not require any Internet connection, and it works across Ethernet port using TCP/IP protocol. Installation can be easily done without seeking system administrator help - Just install the software in all the computers, and the program is ready to use. Users need not add friends' list manually, its automatically done. 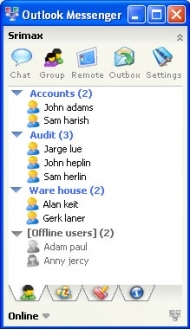 The 'Admin Tool' allows the administrator to configure Outlook Messenger in all the computers from his computer. The 'Broadcast IP' tool reduces network traffic in subnetwork. The 'Terminal Service' tool supports multiple Outlook Messenger instance running in Single Computer. For Windows, MAC &amp; Linux. CapeSoft Office Messenger is a peer to peer office instant Messaging program. It's great for sending all sorts of messages instantly to your office colleagues and it's easy enough for everyone to use. A must for every office. Add a rich suite of live chat features to your website. Interact proactively with site visitors and increase sales. Connect with new customers through a dialog. Watch visitors on your website in real time. Fully customizable visitor interface.